Oh my gosh, I fell in love with this photo even before I took it. It was extreme luck that one of my shots came out non-blurry! Wow! I love all the sticks all over the place! 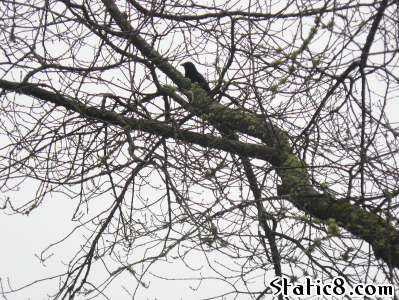 And that's a crow... she was picking through the moss, looking for something to eat, I suppose. I have been wondering what my february project should be. Draw every day? Photo every day? More blogging? Photos during this time of year are so very Grey. But this picture makes me want to take my camera everywhere! Suddenly, I love grey!